I was slightly intimidated by how thick the book is in my hand, 672 pages in all. But before I knew it, I had finished reading it in one sitting. Habibi is a beautifully woven tale about love and longing. The story is about two kids, Dodola and Zam, who found each other in a slave trade, how they survive during their childhood only to lose each other, and finally reunite many years later. It reminds me of the film Slumdog Millionaire and for the similar feeling it evokes. Craig Thompson paces the story really well, taking time to develop the characters, to let the story unfold unexpectedly. The art is beautiful. There must have been tons of research done. The environment are rich with Arabic scripts, symbols and signs, from the clothes to the buildings. The style of art reminds me of Will Eisner, in particular the use of just black and white with no grays, and the composition and blending of visual imagery inside panels. The story deals with mature themes so it's not for everyone. There's slavery, sexual slavery, poverty and the prejudice. It's harsh but believable. The small part on religion comes from the stories Dodola tells to Zam. They are nicely intermingled with the main story. There's nothing preachy and the story always comes first. Craig Thompson has done an amazing job crafting this heartfelt story. This book should be one of the top 10 graphic novels of 2011. I had to take a long breather to digest it all after I finished reading it in one sitting ... and then running out to buy "Blankets". 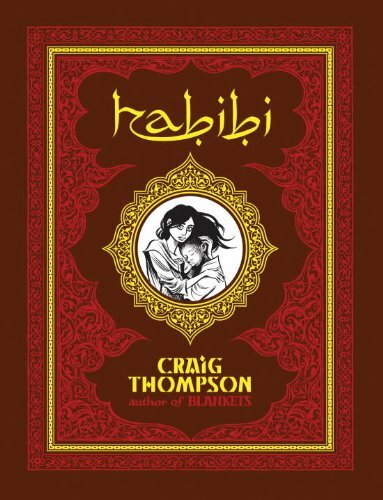 ...oh and a very interesting interview by the folks at Guernica Mag with Craig Thompson on his "behind the scenes" process, concepts, thoughts on Habibi. Yes, it has definitely piqued my interest for Blankets as well. "HABIBI" is now 45% off, run for it !